The Diana Group hosted a “mind healing project” to help ease the stress of Thai flood victims and others concerned about the crisis. Abbot Phra Cholyamunee from Wat Uthukepsimaram led prayers for flood evacuees hosted by Diana Group Managing Director Sopin Thappajug at the Diana Garden Resort Nov. 8. Sopin also presented the monk with a donation of food and necessities for flood victims. Abbot Phra Cholyamunee from Wat Uthukepsimaram urges evacuees and those concerned by the flooding to remain calm and not lament the losses of material possessions. Phra Cholyamunee performed evening prayers and preached a sermon to urge evacuees and those concerned by the flooding to remain calm and not lament the losses of material possessions. Those can be remade or repurchased, he said. If the mind is lost, however, everything in life will be lost too, he said. The abbot encouraged victims to fight obstacles in life and said their problems will pass soon. 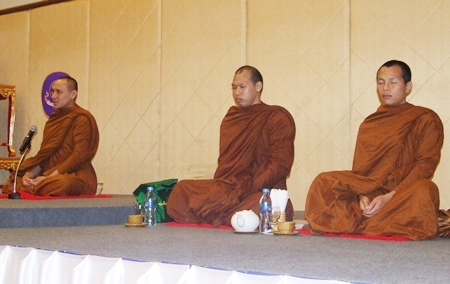 The program was part of the Diana Group’s ongoing “Dharma on Time” initiative in which Buddhist lecturers host televised sermons and spread the teachings of the Lord Buddha.